Yesterday we looked at ways to ensure that your equipment is operating properly and safely in colder temperatures and messier winter conditions. Today let’s look at some adjustments operators may want to make to enhance safety while they operate forklifts and other heavy equipment this winter season. Dress appropriately. If you’re working outdoors, dress warmly. Dress in layers so that you can go from outdoors to indoors, including into and out of a climate-controlled cab, easily. Wear insulated socks and gloves. Be aware of how your clothing affects your hearing, vision, and “feel” for the equipment; you may need to adjust. Don’t touch frozen metal surfaces bare-handed. Whether you’re inspecting your equipment or climbing into or out of your cab, make sure you have gloves on; touching frozen metal bare-handed can cause instant injury to the skin. Don’t slip. Steps, handholds, and grip plates may be iced and slippery, so be careful climbing into the cab. Be careful climbing out, as well; if your cab is climate-controlled, you may not be thinking about how cold and slick that first step could be. Make sure your route is clear. Poor traction can affect heavy equipment just as it can cars, and iced-over areas may hide ditches, edges, and uneven terrain where the ice may not hold your vehicle’s weight. 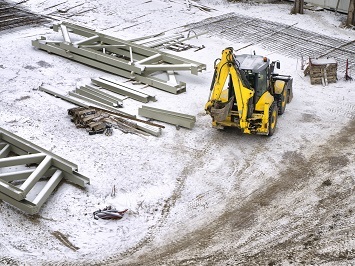 Obstacles and hazards that could damage your equipment may be covered with snow or ice. Be sure to keep any traffic lanes clear of snow and ice as much as possible, and spread grit as needed. Slow down. Remind operators that speed decreases their reaction time and increases the severity of any impact, and slick surface conditions will also increase the time and distance needed for turning and stopping. When operating conditions are less than optimal, it’s best to slow down. Be especially careful on ramps and bridges. Elevated surfaces are the first to freeze. Avoid operating in poor light. If you’re working on an industrial or construction site, your headlights alone may not be enough to show you ground conditions or overhead hazards. If there’s not enough light to see what’s in front of you or above you, ask for more light. Take breaks. The colder it gets, the more easily workers will tire. In addition to scheduled breaks, workers should be aware of how the cold is affecting their energy or concentration and should take warm-up breaks as needed. Have warm beverages and healthy snacks available.